Riviera - an aesthetically holistic coastal territory, where, provided that the specifics of visual perception are duly considered, the integrity, beauty, and picturesqueness of spatial processes of interaction between settlements and the coast is reflected through the development of cultural recreation landscapes. The map of the coastal organization is created as a result of the landscape and architectural assessment that evaluated not only functional and utilitarian requirements reflecting current transportation, communication, and settlement situations, but also aesthetic, architectural, and artistic (scenic) qualities of landscapes and conditions of their development within the belt of the best visual perception. Structurally, this map represents a system of landscape and architectural centers, axes, zones, and basins. Two zones are identified in the belt of visual perception (approx. 8 km wide): the zone of the best visual perception and the zone for developing visual perception (inset) that include the main types of natural landscapes assessed by their aesthetic value. 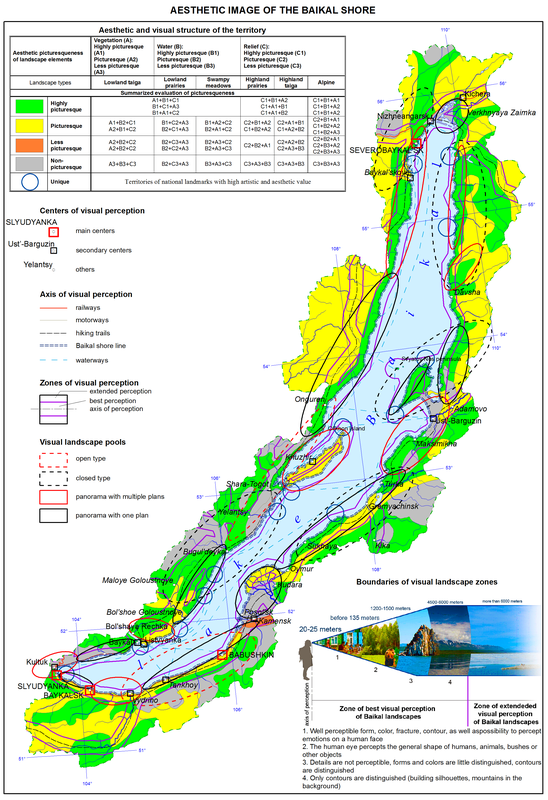 Segments of the Baikal coastal area are considered as the landscape and architectural basins. Visually, they are relatively homogeneous and located within the open or closed angles of view from recreation centers and settlements and from some segments of highways.